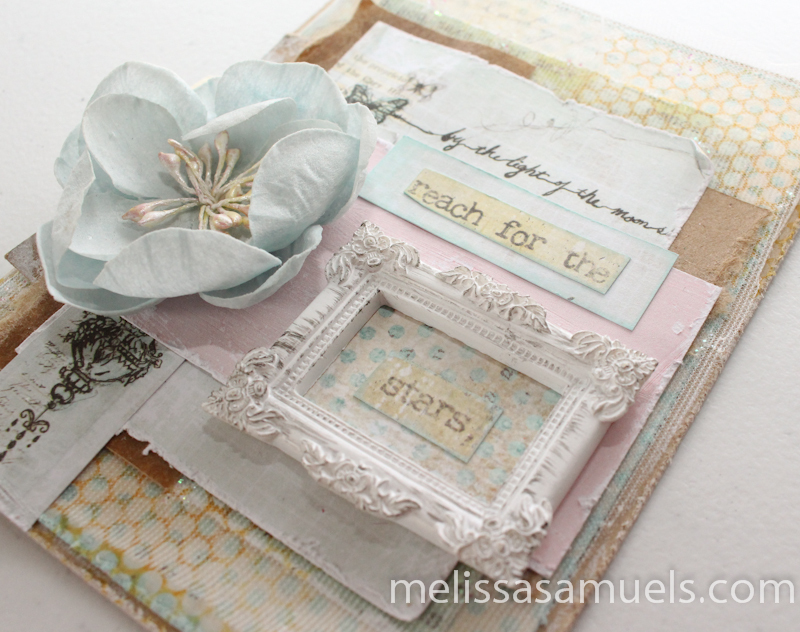 Week of Cards Day 1 – Reach for the Stars | Melissa Samuels - "The Art of Scrapbooking"
First up is my favorite! 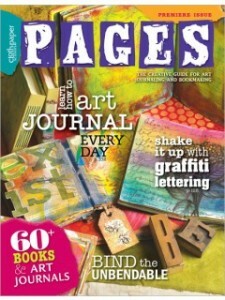 I love it because the gorgeous layers of paper and stamping give it such dimension. Also, the inspirational quote is awesome! I had an ATC pad of Prima Epiphany paper that had a wonderful quote, “by the light of the moons.” I found a We R Memory Keepers 12″x12″ paper in my stash called Phraseology with tons of great words and quotes. I cut out the words “reach for the stars” and added them to the ATC paper. 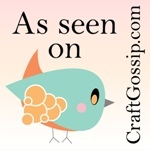 The base of the card is Bazzill 8 1/2″ x 11″ Kraft cardstock (makes two cards when cut at 5 1/2″ on the 11″ side). Kraft cardstock is my “go to” for cards. I love the earthy look and feel. The first layer is We R Memory Keepers 12″x12″ Nuance paper. I used the beautiful blue dot side, and inked it with one of my favorite stamps, Finnabair Honeycomb in Archival Ink Dandelion. I also used this paper for the resin frame. I added netting, and I had some scrap paper that sorta looked like paper grocery bag that I tore, and used as another layer. Don’t be afraid to use everyday items in your work if you think it is pretty. 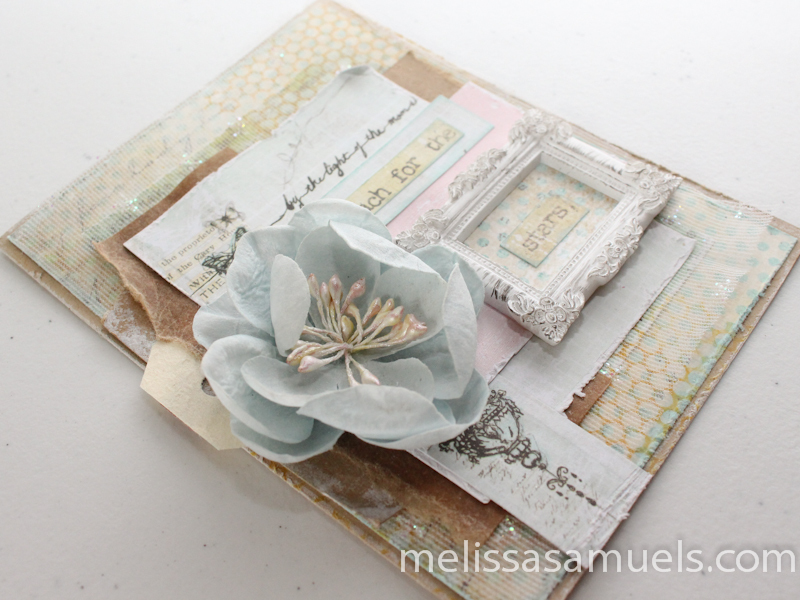 I can admit I have spent many a night digging through the recycling bin…don’t judge .The beautiful blue flower is from a Prima pack, and the resin frame is Prima also. I hope this card inspires you not only in the design, but also the inspirational quote. Reach for the stars, and make your dreams a reality! 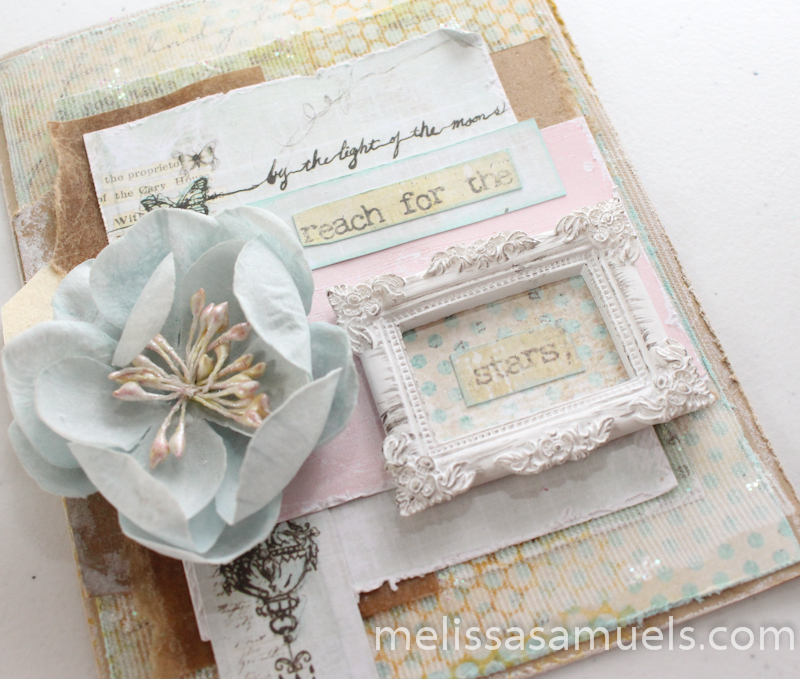 In my eyes you can’t go wrong using Prima! Beautiful card!!! I love all the layers! It’s simply beautiful!!! Great work Melissa! Beautiful card! 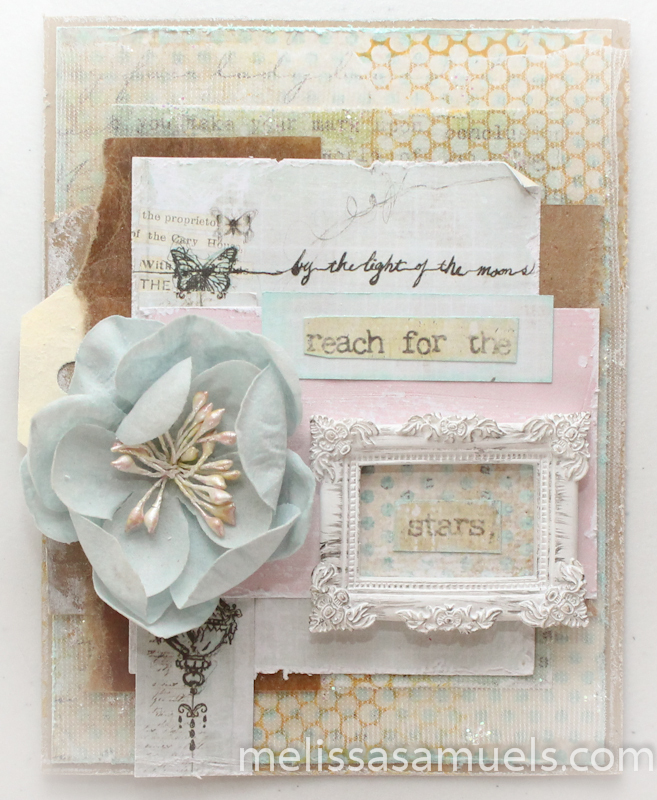 Love the way you layered it and such lovely colors!